Aquatic Resources - Meridian Environmental, Inc.
Meridian field biologists perform annual spawning surveys upstream of Swift Dam to determine the spawn timing, distribution, and abundance of transported anadromous fish (coho and spring Chinook) to support an overall assessment of the success of the anadromous fish reintroduction program upstream of the Lewis River Hydroelectric Projects. We also conduct seasonal spawning surveys downstream of Merwin Dam to quantify coho spawning escapement. Survey methods include walking, drift boat, raft, kayak and jetboat as conditions dictate. Meridian manages data entry, data analysis, and reporting. 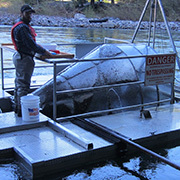 Meridian field biologists operate three rotary screw traps in the North Fork Lewis River basin to quantify the number of out-migrant salmonids that enter Swift Reservoir and downstream of the three-dam complex. Meridian assists with trap installation and operate the traps 7 days per week for approximately 4 months each year. During each daily trap check, we measure and mark a subset of all salmonids collected in the trap with PIT tags or tattoo marks and release fish upstream to estimate trap efficiency. Meridian conducts all data entry, analysis and reporting to estimate total out-migrants by species and life stage at each trap location. 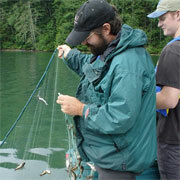 Species handled typically include cutthroat, rainbow, and bull trout; coho and Chinook salmon; large-scale sucker, northern pike-minnow, lamprey, whitefish and sculpin. Meridian designed and conducted a limiting factors analysis of bull trout in tributaries to Lake Merwin and Swift Creek Reservoir. We developed a set of physical habitat criteria for each life stage, and collected fish presence, water temperature, and habitat data to rate 16 streams based on these criteria. The Qualitative Habitat Assessment (QHA) method was applied to define limiting factors by life stage for each stream. Results of QHA were used to rank streams for potential bull trout restoration. Meridian trained Upper Skagit Tribe staff in methods to surgically implant acoustic tags into juvenile salmonids to support an assessment of steelhead life history in the Skagit River basin. Meridian developed an acoustic tagging protocol and training materials, and conducted in-person training and post-training evaluation of tagger performance in the field. Training including preparation of videos on suture knot tying and written and classroom presentations on aseptic techniques, tagging station setup, fish anesthesia procedures, surgical tag implantation procedures, and fish recovery post-tagging. Meridian developed and implemented a study to estimate bull trout spawner abundance and distribution in two tributaries to Ross Lake within the North Cascades National Park. 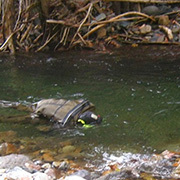 Bull trout spawner abundance and distribution were assessed using snorkel-based surveys. Total abundance was estimated using relationships observed between habitat type and snorkel counts (using aerial photo interpretation and in-field habitat mapping). Changes in potential spawning habitat distribution and total abundance were also assessed by comparing results to surveys conducted more than 15 years prior. In cooperation with the University of Washington, Meridian biologists designed and conducted field studies for a resident trout limiting factors analysis in Spada Lake. We collected and integrated data on the fish species assemblage; the size, parasite load, and abundance of trout and brown bullhead; and fish forage base (zooplankton and neuston) distribution and abundance. Since being listed as endangered in the Klamath River Basin, the USFWS has sought to protect the diminishing habitat of the native Lost River sucker, but then turned to hatchery options to preserve the species and aid in their recovery. 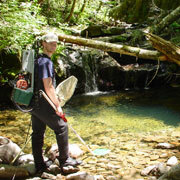 Meridian was part of the team that evaluated eight sites throughout the basin to assess the following: a water supply that could be permitted, sufficient space for hatchery facilities and operator housing, biosecurity for a listed species, site access, and potential to obtain regulatory approval. 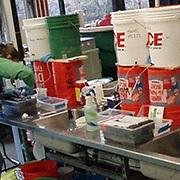 Analyses and recommendations were provided to the USFWS. 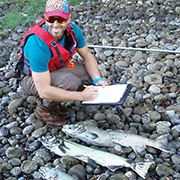 Meridian staff provided documentation and technical support to the Hatchery Scientific Review Group (HSRG) in evaluating over 300 hatchery programs in the interior Columbia River Basin. Our biologists compiled background information about each salmonid population affected by hatchery programs that provided the basis for HSRG member recommendations. Meridian prepared all population and ESU reports and maps to document the work of the HSRG and identify how to recover and conserve naturally spawning populations, and support sustainable fisheries.